Welcome back! 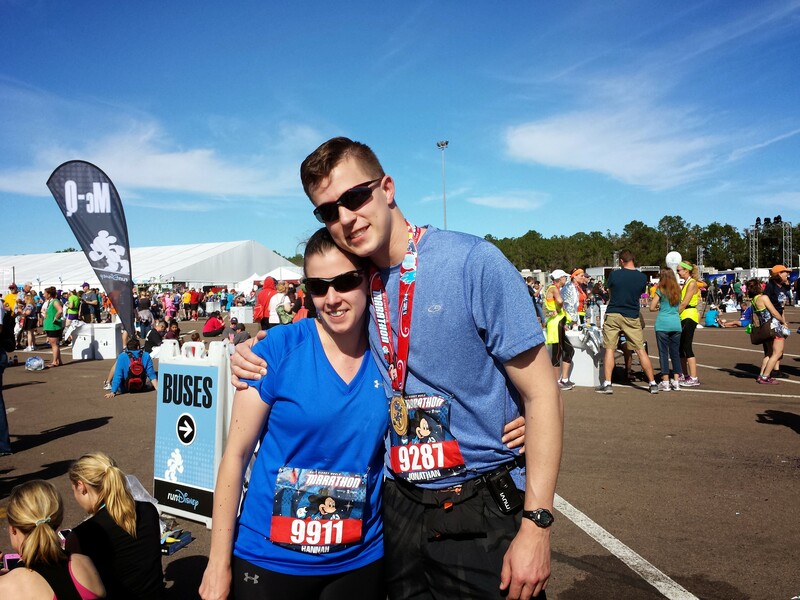 If you missed it, check out part one of our Walt Disney World Marathon 2014 trip here. We left off Saturday night all prepped and ready for our race the next day. BTW – if you are staying on property check if they have “runners breakfast” to-go available. We grabbed these Sat night and they had a plain bagel, peanut butter, a banana and some other things in them. We set our alarms and woke up at 230a. Our plan was to have an hour to get ready, but we ended up only needing a half hour. It all worked out though and were on the second bus out of the resort over to the race. When we got there we found a spot to sit down and we slowly ate our breakfasts. I could barely eat and I don’t touch Peanut Butter before a race (hate burping that stuff up!). A guy sat down next to us and started chatting with us. He was surprised to see a husband and wife out there together as his wife was still in bed at the hotel. And, he said she often doesn’t even travel with him to runs. Guess we are blessed! Soon it was time to head to the starting corrals. I was in a corral behind DH (not sure how that worked out…) so he jumped back to be with me. We were in the second to last corral so we had awhile to wait. I was so glad I had brought along two big trash bags from home, they served us well and kept us snuggling and warm before the run. We again were chatting it up with some people nearby. If the guy who carried his “kids” with him reads this, let me know! It was great talking with you and I wish I had gotten your bib number to see how you had done in the race! Finally it was our time to start. I have to say I am impressed that it really wasn’t too long of a wait for us, even 14 or so corrals in…Disney got ’em rolling well. I also get so emotional at the start of a race. I think its the anxiety and excitement and all the people who are doing it, it just gets to me. Wow, so fun! Disney knows how to start a race I will tell you that! Right away we saw my parents. I was so excited that they were able to spot us in the dark and in the big crowd! I can’t say enough how much it helped having people cheering us on and to see them right at the start was awesome!! I don’t remember a lot of about this. We did a walk/run combo as needed. My running is def improving and I am able to actually run for longer which is great. I also can’t believe how easily the start of the race flew by. I was barely feeling it at this point! Wow! I really never get over how awesome it is to not just BE on main street, but to run down it with so many fans cheering you on. So amazing. I will say I think Disney needs to adjust the course a little once all of Fantasyland is cleared of construction walls. The course gets really narrow up around the teacups and Pooh. I wish we had stopped for a photo in front of the castle, but maybe next time! Jon stopped in Frontierland to use the bathroom and I took off for a little… I felt bad because he ended up having to sprint to catch me. Ugh! Boring! I never mind the first part of the race, before you get to Magic Kingdom. But then afterwards it feels like the next “thing” is soooo far away! I lost DH to a bathroom stop again. It was leaving the track that I started to get the nagging pain in my left hip that had plagued me at the Philly Half back in November. Ugh…I stopped and stretched it for a second and then kept going — hoping it would work itself out! This was my downfall. The hip problem did not work itself out at all. It just got worse and worse and spread to my knee. To the point that my knee cap felt like it was going to snap. UGH!! I was so frustrated with this. I thought for sure the extra cross training I had done had helped. I also thought the extra rest and the warmer weather would be better. Guess not. By the time we got to mile 12 I wasn’t sure how much more I could pull off. As we entered Animal Kingdom I finally let DH in on how my bad I was feeling. He asked if it was serious and I said I wasn’t sure if I’d be able to finish without seriously injuring myself. We spent the mile talking it out and I finally convinced him to go on without me. As we rounded out mile 13 and hit a water stop, we parted ways. I talked to someone at the water stop who instructed me that the swag wagon would be pulling up the rear of the race and I would have to wait for them. She checked and was told it was 4-5 miles back from where we were ….which meant at least an hour of waiting. I sat down and cried and felt sorry for myself for a good fifteen minutes. Then i fretted and felt sorry for myself some more. And then I realized this isn’t who I am and that I had done this distance before and needed to at least do more than I had previously done. I will say I am super proud that I did PR on my half marathon time. If I had not sat down where I did, I could prove that I PR’d through my timing chip, but I happened to sit down about 100 ft from the ticker point and therefore my time on the chip is waaaay off. This was tough. I managed to do a walk/hobble (not quite a run!) for the next mile. MAN, did I have to pee though! Right before the 14 mile marker was a medic stop. I stopped to grab a tylenol, which made me think…how much further can I go if I take a tylenol…at least another mile… so I kept on truckin’! I was holding out pretty good through here. I couldn’t do anything except walk at this point without my knee killing me. But, I could still walk just fine. So I did that. There was a food spot somewhere along here with Clif gels. I stopped and talked to one of the bike medics about the pain I was having and if I should pull out. He said it sounded like it was really up to me. I wasn’t having shortness of breath or anything that was medically dangerous, but I was having pain that could cause injury (if it hadn’t already). He informed me that the next medic stop was just “over the hill” if I thought I could make it to there, they might be able to help. I thought, hey…why not. So I kept going again. That hill was a bugger though! I happened to cross the 16 mile marker on my way! I stopped at the medic stop and they weren’t really able to do anything. They didn’t have tape or wraps or anything and could really only offer me tylenol. They didn’t even have any bio-freeze left. I had a choice to make. I could wait for the swag wagon (which was at this point only about 2 miles behind me) or try to keep going. Since it was my third time stopping I decided to wait it out and pull myself from the course. My thoughts were this. I knew whatever was going on is a problem that I’ve been having for awhile and need to get taken care of. I knew that if I made it to mile either 18 or 20, I would want to push myself further and finish the race. I thought that if I pushed myself to finish I might cause serious problems with my hip and/or knee (my family has a history of knee problems and I’m trying to avoid needing a knee replacement when I’m older). I knew I would be proud of doing 16 miles — more than I had done before. So that was when I was like…okay…its time to stop for real. As the end of the race made its way to us it was really inspiring to watch all the runners. I truly want to make it out and just cheer someone else on one of these days! I especially love the people who are holding in and bringing up the rear. The fact that they just keep going even with the balloon ladies right there is really something. I’d be so stressed if those ladies were that close to me (although they seem nice!). So we waited… and waited… for a van to come and get us. If we got on the bus, we’d have to wait and follow the end of the course. But they were running vans back to the start line. They filled up the first van with people who had medical needs that weren’t urgent. Then they loaded the rest of us into the next van. At this point I was smiling. Yes, I was disappointed that I didn’t finish, but I had made a decision and felt okay with it. There was a woman in the van who had all her dopey bracelets on and was crying. I felt so bad. I just wanted to reach out and hug her, but she was trying not to let people see that she was crying and wasn’t really chatting with anyone. Normally I would’ve approached, but I get that people need to have their space and deal with what’s going on so I just let her go. So that’s where the fun begins. The van had to cross over the center grass between the highway lanes in order to get us back to the start. It had been rainy in Florida and it didn’t go so well … our van at first couldn’t make it…and then got stuck. And, then the driver tried to get unstuck while we were still in the van which made me nauseated. Finally they unloaded us and called another van. So we sat on the highway and waited and watched as trucks came along to try to get the van we were originally in…out of the mud (they couldn’t by the way). Our second van arrived and we were off. I got quite chilled sitting on the highway and the need to pee settled in really quickly and really aggressively! As we drove off to Epcot I swore I was going to pee all over the van, but I didn’t. Getting out of the van after not finishing is a really weird experience. As soon as you step out they take your bib number and hand you a medal. There’s no like…here, would you like a medal. Nope, its pretty much thrown in your hands. They also offer snacks, medical attention and a few other things. I had to pee so bad so I just asked for the nearest porto and jetted. I didn’t grab any snacks or anything (which I regretted later). So here’s where the problems arose. When DH and I parted, he took the cell phone with him…and the watch. I had no idea what time it was or how to get a hold of anyone. So I asked if there was a way to get a hold of family members and they informed me that at the CIGNA tent were free cell phones to use. This is awesome! I didn’t know this existed! I had some trouble getting a hold of anyone, but was able to meet up with my dad eventually. We hung out near the finish line waiting for Jon, but we ended up missing him somehow. We did catch up with him, his mom and my mom after quite awhile of sitting in the sun (sunburn, yup). Here’s a photo of DH and I after the race! I am so proud of him finishing!! Seriously annoyed he finished without an ounce of training. Yup, not even working out…not training. Unless you count beer on the couch! But proud of him for pulling it off! I was such a ball of emotions. DH’s mom couldn’t understand why I refused to wear the medal. I guess its hard to explain to someone, but I didn’t do a Marathon so I don’t want to wear a marathon medal … I’m still trying to decide what to do with it. I’ve toyed with having my brother cut a notch or crack into it and I’ve also toyed with using it to make a shadow box for DH … we’ll see. I’ll wrap up the rest of our trip in part 3!